You may have read in our recent blog posts that October is National Cybersecurity Awareness Month. Of course, at Eze Castle Integration, we love to talk about IT security for alternative investment and professional services firms. To participate in National Cybersecurity Awareness Month, Eze Castle Integration is launching a Cybersecurity Educational Series to guide the alternative investment industry through the complex and evolving cybersecurity environment. This educational series will include the launch of an online Cybersecurity Information Center, three new whitepapers and a series of educational webinars. The Information Center features videos, guidebooks and articles on the latest cybersecurity risks and best practices for implementing a proactive security posture. Click here to view the Information Center. 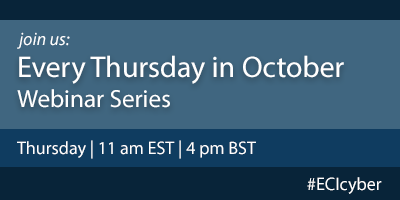 To support the online information, we’re hosting a series of webinars that will occur every Thursday throughout the month of October at 11:00 am EST, 4:00 pm BST. With the ever-changing regulatory and investor landscape, Information Security Plans are critical for alternative investment firms to comply with SEC regulations, due diligence requests and state laws. This webinar will cover the nine steps to create a comprehensive Written Information Security Plan. This webinar will highlight common security shortfalls and shed light on how managers can take steps to mitigate and remediate these critical security concerns moving forward. Common gaps we’ll discuss include misalignment of security layers to risk profile, vulnerability assessments and remediation, IT asset management and vendor risk management. When a cybersecurity incident happens, it is crucial to act fast to minimize any inherent risk to your firm. That said, being able to act swiftly requires you to have an Incident Response Plan in place. Join experts to learn the steps to create a plan for before, during and after a cyber incident, including sample incidents and appropriate response steps. When confronted with unexpected business disruptions, investment firms must react swiftly, methodically, and successfully or else risk significant financial loss to the firm. Come learn from Eze Castle’s Business Continuity experts on which threats pose a risk to your firm and the steps to create a business continuity plan. To speak to one of our cybersecurity experts, contact us here. This entry was posted in Hedge Fund Technology, compliance, Live Blogs. Bookmark the permalink.